They have to move it [the bill] by the end of January or it’ll be dead. We spoke to Riches again earlier this week and she confirmed the bill would not be heard and would therefore be dead at the end of January—today. It’s officially time to celebrate. The deadline has passed—SB 350 is dead, dead, DEAD! We lane splitters are in the clear for now, but it’s likely we’ll face this challenge again—lane splitting is an easy target for politicians looking to score points with California drivers who are frustrated with “idiots on donor-cycles” that “come out of nowhere” and “weave in and out of traffic” and “cut in line.” Broken record time: riders must be good ambassadors for lane splitting and motorcycling in general. Pay attention to the CHP lane splitting guidelines: keep your speed differential reasonable, don’t split when traffic is moving too fast, maintain a consistently high awareness of your surroundings on the road. Those of you who split crazy-fast and regularly hit mirrors while crying about how the “damn cagers” are always cutting you off—cut it out. Check the entire history of SB 350 here, and more on lane splitting legislation here. 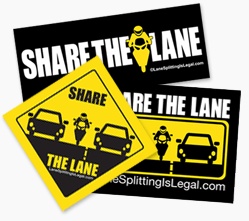 If you’d like to support our mission, order some lane splitting stickers and put ’em on every vehicle you own and maybe even some you don’t—but you didn’t hear that from us. 🙂 Every sticker we sell here on the site funds the distribution of free stickers around the state, not to mention keeping this website live. Thanks for your support! We have to fight back let’s demand a motorcycle lane only see those morons like it smdh!! Most the “lane splitters” I see are violated the “Basic Speed Law” by going substantially faster then the slower moving traffic on the freeways, in the Inland Empire, and that includes several motorcycle officers that use the northbound I-15 in the morning. • The number and speed of other vehicles on the road. • Whether the road surface is smooth, rough, graveled, wet, dry, wide, or narrow. • Bicyclists or pedestrians walking on the road’s edge or crossing the street. • Whether it is raining, foggy, snowing, windy, or dusty. I thought I was the only one having a problem with those idiots who speed and zig zag through slower traffic (usually without even using a signal) and I constantly pray that my car isn’t going to get hit. I go out of my way to make room for the honest motorcyclists who do the proper lane split. But the idiots out there need to to be stopped somehow. I’m glad I’m not the only one who feels that way!